On the road to and from Santa Fe, I drive past a herd of grazing bison. That sounds like a great sight, except that these particular bison, popularly but inaccurately known as buffalo, will soon end up dead on someone’s dinner plate, because that’s what they’re raised for. Buffalo has become a “fad” meat because it’s low in cholesterol and fat. Today there are scattered bison herds in the United States and they number about 80,000. It’s hard to believe that there were once around 60 million of them. Indians used to kill them for food, clothing, tools, weapons, blankets and shelter, but they were subsistence hunters and never took more than they needed. That was before settlers and hunters started migrating west and decimated bison just for fun or to clear space for their towns, farms and ranches. The tall-grass prairies where bison flourished were destroyed to grow human crops, and the mixed and short-grass plains became food for voracious and destructive domesticated cattle. Now you can only see captive bison ghettoized in various public parks, zoos and private ranges, such as Yellowstone National Park, Theodore Roosevelt National Park, and Custer State Park. Bison are not considered endangered anymore even though there are far fewer than there once were. Sadly, some herds are still hunted when their population is considered to be too large for the area they are squeezed into and “surplus” bison are auctioned off to private interests. Unlike cattle, buffalo can endure extremes of temperature and cannot be easily herded. Still wild creatures in spirit, they retain their independence and dignity. They are the largest land mammal in North America. Bulls are 6 feet tall at the shoulder and can weigh up to a ton. Cows are smaller at about 5 feet and not more than half a ton. Their distinctive heads, shoulder humps, and forelegs are covered with brownish-black, woolly hair. Both males and females have horns. Bison like the open plains and grasslands, and, like cattle, they are ruminants. They are highly gregarious, although the non-dominant bulls are usually separated from the herd. A bison’s predators are humans, grizzlies and wolves. During the rut from July through September, bulls fight each other fiercely for cows. Calves are born in May or June and within three hours are able to travel. Bisons can live up to twenty years. Also on my drive, I can often see a few Pronghorns grazing along the side of the road. They are truly unique animals-not deer, goats or antelope, but surviving members of a unique ancient family. This particular small herd is relatively safe because it’s not hunted, but it is still captive. There is fencing all around its steadily shrinking territory that encompasses both private and public land. Pronghorns are poor fence jumpers, although they have been known to crawl under fences. On the other hand, they are the fastest animals in the western hemisphere, achieving speeds up to 60 mph, with a large heart and lungs that give them great endurance, large eyes for great eyesight, and powerful legs to keep them moving. A Pronghorn is about 3-1/2 feet tall, tan, brown and white with two branched horns rather than antlers that nevertheless shed just like antlers. They have two white neck bars, a white rump patch and a buff 4-inch tail. The male has black on his nose and neck and black horns, with longer horns than the female. When Pronghorns sense danger, the white hairy discs on their rumps flare out and they emit a musky odor to warn other members of the herd. Then they run to escape, and often do. Besides humans, their predators are bobcats, coyotes and wolves, but they can fight back effectively with their strong hooves. They are high-strung and active all the time. They eat forbs, shrubs, grasses, juniper, chamiso, cacti, crops, and sagebrush in winter. They breed in the early fall with twin fawns born by June who lie motionless so as not to attract predators. Despite that precaution, 40% of them die. A Pronghorn’s life span is up to ten years. Like the bison, pronghorns are protected and managed (a euphemism that means keeping captive populations in check by hunting or selling individuals off) on public and private refuges. 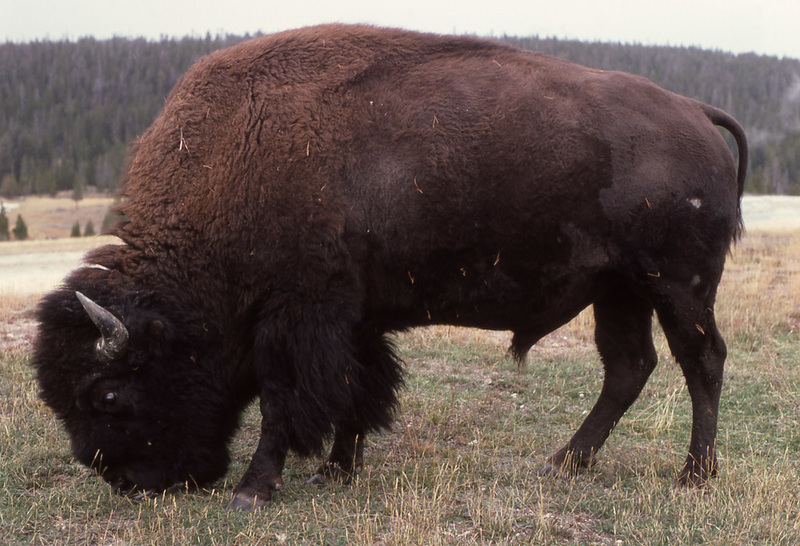 There used to be many millions of them, second in numbers only to the bison, but due to hunting and loss of habitat because of westward expansion, they were reduced to 20,000 by the beginning of the 20th century and now number around 500,000. Like buffalo meat, Pronghorn meat is also popular among food faddists because it’s lean, and so Pronghorns are still popular hunting targets. Three of the five subspecies are endangered and number only in the hundreds. Pronghorns are able to withstand extremes of weather and are found in all four southwest deserts. They can be seen at places like Cabeza Prieta Wildlife Refuge, Fort Peck Wildlife Refuge, Organ Pipe Cactus National Monument and on certain Texas roads, having to share the land with the cattle that helped cause their population to plummet.My ride into Santa Fe evokes mixed emotions. While I’m glad to get a glimpse of their wild beauty, I also pity the buffalo and the Pronghorn. They are only two of the many species that humans, in their ignorance and arrogance, have practically destroyed and then have allowed to survive, but only on their terms and in much diminished numbers.